Knockety knock, knockety knock. Who's that knocking on Christmas Eve? Is it the trolls who come every year and gobble up Kyri's Christmas feast? Kyri is worried, but when she peeks out and sees the boy from Finnmark and his ice bear, she opens the door and welcomes them in. Knockety knock, knockety knock. Who's that knocking on Christmas Eve? This time it is the trolls pounding on the door. But they can't get in. Knockety knock, knockety knock. The trolls pound even harder. Suddenly there is a loud crack and the hungry little trolls burst into the hut. 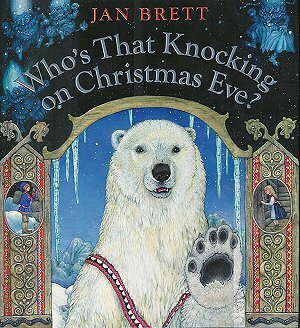 Will Kyri, the boy, and his ice bear be able to save the Christmas feast? Jan Brett and her husband, Joe Hearne, went to Norway for her story, based on an old Norwegian folktale. They traveled all the way the the northern province of Finnmark, where the polar bears live and the northern lights radiate across the sky. Special thanks to the Brookfield Zoo in Brookfield, Illinois, and to Dr. Lee Cera and the staff for their introduction to Kinapak the polar bear and for providing slides and photographs of Kinapak from his birth to the present.